Im just wondering if anyone as heard of 'Power Over Wireless' the transfer of electricity to things such as cell phones without a cable. It works similar to the electric toothbrush!!! Nicola Tesla Experimented a lot in this area during the early part of the 20th Century. Most importantly, he built a massive hybrid power, radio, and research tower on Long Island, called the Wardenclyffe Tower. He never got it to work, and it probably would impede a lot of wireless devices, but it it interesting. Yeah, I think its a great technology. If its supported and developed it could be used to develop everything from nano-technology through to renewable energy in distaster zones. Ive this cool floating turbine, which spinds around and transfers electricity to the ground to power emergency hospitals etc. Short range transfer of power has been used for years in devices such as electric toothbrushes as you mentioned as well as to charge early pacemakers which could not be taken out everytime they needed a charge. The over all concept is nothing new, nor overly complicated. It works on the fact that electric currents create a magnetic field. This field creates a magnetic flux which can be induced on coil of wire that will in turn cause a current to flow. Try reading up on self-inductance and how inductors work, as it is based on the same theory. I remember there being a bunch of different charging mats in production. Search through Engadget archives. The way a charging mats works is basically have a bunch of electromagnets that are changing thier magnetic field. When you put the adaptet in your device and put it on the mat, it uses induction to charge. I personally do not like the idea of strong fluctuating magnetic fields getting too close to my electronic devices. Obviosly, there are already a lot but it is different than having a strong ones right underneath! 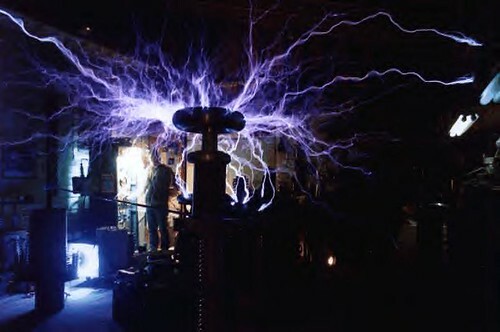 I find it odd that Tesla developed the principal of transfering electricity through the air over 70 years ago but its only recent years that other scientists have started to develop it. MIT University have developed a coil to transfer power to a laptop and Japan University have developed a 1mm thin film which sits on top of a table and power objects on top it - in the picture I saw they used a miniture christmas tree complete with lights! Are universities able to take out patents - I heard a cellphone company took out a patent to charge cellphones whilst they remain in the pocket! I have been forwarded a cool link to a documentary about Tesla if anyone wants to watch it. Power over wireless ISN'T the inductive power you see with these charging mats as they don't have any range. Its interesting to see so many different views, I think if this technology is supported and developed it could be used accross all sorts of applications. I dont know how the system MIT developed, apparently both Microsoft and Sun are developing USB power input systems. Thats pretty cool, is there any other information? Such as dates as to when this technology might come out or any similiar patents by Apple? The problem with wireless power is that strong magnetic fields come along with it. Hard drives would die and sensitive electronics might get fried. Not saying that it couldn't be done, there would just have to be a ton of development put into sheilding everything so we don't destroy our gadgets every time we try to charge them. Not sure how/why you are lumping POE in this group. But anywho, currently our staff has deployed all switches with POE and are moving to Cisco IP phones. All told somewhere around 300 phones for testing before rolling more out. We have somewhere around 3000 employees last census. All our wireless AP's are now POE which is nice since we dont have to have power injectors anymore in our network closets. What a mess let me tell you. We have around 150 wireless AP's soon to double. POE makes it nice for IP phones and AP's. Take a phone anywhere on our network plug it in...no problem...same with AP's. Of course its just as easy to take a Cisco Wireless phone around...but heh. My office has only one power outlet for my monitor and laptop. My phone is of course IP based and uses POE. According to an article on the BBC site Wireless Energy is beginning to take off. But will they ever make it FREE.. like Tesla wanted? No as if!